Firepower Nandinas look beautiful on their own or as a cohesive addition to an existing landscape. They add drama to a living wall privacy fence of evergreens when planted at the base of tall Leylands, Emerald Greens, or Thuja Greens. 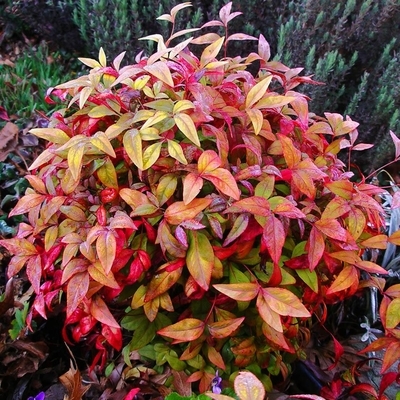 If you must prune your Firepower Nandina, selectively cut the stalks and stagger the heights of each cane instead of cutting them all off to the same height. Firepower Nandina is resistant to deer, drought, heat & humidity, pollution, rabbits, seashore, slope, and wind. Ships in a pot currently 5-8 inches tall.